On Tuesdays I work for my friend Katherine in her expansive garden that encircles a peach-colored gingerbread Victorian called “the Marlahan House” where she lives and grows vegetables for the Saturday farmer’s market in Etna. All summer long, Katherine’s garden was a lush forest of blossoming, fruiting things: rows of peppers, tomatoes, and tomatillos, boxed hedges of brassicas: kale, broccoli and cauliflower with lazy cabbage moths flitting through the leaves, thickets of fragrant herbs tucked under the shade of swooping maples and black locust trees. My very favorite piece of the edible landscape is a blanket of grapevines growing up against the patio as a living sun shade; the clusters of fruit hung down just within reach. These vibrant colors and flavors saturate my summer memories like raspberry-stained fingers. Yesterday, I returned to the garden only to find the dramatic shift that takes place after the first freezes of fall. Stalks have lost their will to stand and droop like a row of sad Charlie Browns, leaves wither and their colors fade, vines seal off and shrivel like shed snakeskin. All this loss marks the end of the annual plants’ life cycle. We pull them from the ground and mix their remains with water, ready compost and nitrogen-rich used chicken bedding to make a feast for the microbes that will return a summer’s worth of plants into ready soil for next year’s garden. New life from death. Death seems like such a manageable, and perhaps even quaint, participant in the beautiful scenes of fall. We never think of the glorious rusts, golds and ochres splashed throughout the treeline as the plants’ sighing goodbye from a season of plenty to a season of lonely want. The deciduous trees let go of the only part of their bodies that metabolized sunlight into energy and let those precious little food-machines fall on the ground and die! On crisp, sunny afternoons we are actually raking up thousands of little symbols of the great cost and courageous risk of embracing death. But the autumnal deaths we see happening in nature don’t really scare us or make us sad, right? We know that spring is coming. We have unwavering faith that everything will be restored by April at the very latest. Why is it, then that we have such difficult time accepting the onset of autumn in our lives? Why does a pay cut feel like the end of the world? Or the loss of a job, a friend, a car, a house? What do we do when the savings account is drained? When you are passed over for a promotion again? When a loved one fails you again? When a dream is deferred again, again and again? The only way I have come to accept the onset of fall and its season of death in my life is to recognize that all the things I have been given; jobs, money, possessions, friendships, goals, etc -they are all like leaves. Each one is a gift that can offer joy but cannot sustain the tree forever. Just as leaves come and go, all things in our lives will fluctuate throughout the seasons. Whether we’re ready for it or not, they can fall at any time. That being said, I find that just telling myself “attachment is futile” doesn’t really cut it. Losing things really hurts, and platitudes about the fleetingness of life usually make me feel worse. I’m not very zen like the trees outside -I desperately cling to my leaves and try to glue them back on! The Psalms of David have been a healing place for me in the midst of autumnal circumstances, because David strikes an insightful balance between blunt honesty about his feelings of struggle and pointed truth about what God is already doing for him. In Psalm 62 David reminds himself that God is his true sustenance —all the rest is just leaves. When the outside circumstances are dried up and lifeless it is absolutely critical that a tree not do the same inside. As the temperatures drop, deciduous trees actually change their cell contents to prevent the freezes from breaking each cell. The tree carefully saves the water it has gathered and actually enjoys a tiny amount of heat from the movement of water in and out of the cell wall. In the autumnal Psalm 22, David is candid about his sadness and yet he still lets the truth of God that he absorbed in the springtime of his life flow in and out of his cells like a frost-bound tree. Truth can renew us this way, and warm our souls during the autumn freeze. While the tree sustains itself through its slow, methodical water circulation, it rests. While it is resting, the season slowly changes: each leaf that was released to the ground is metabolized by microbes in the soil, fertilizing the root systems of the tree as the thaw brings it back to life. In the same way, allowing the hope we placed in our leaves fall to the ground and die is like fertilizer for a renewed sense of hope God is cultivating in us. Fall is as important to the renewal and restoration of each ecological system as the more fruitful, growing seasons. That’s the mind-blowing thing. Death clears the way for new life; it enables and empowers growth and transformation. What is God renewing in you this fall? Are there leaves you need to let go of? What truths do you meditate on to keep from drying up? 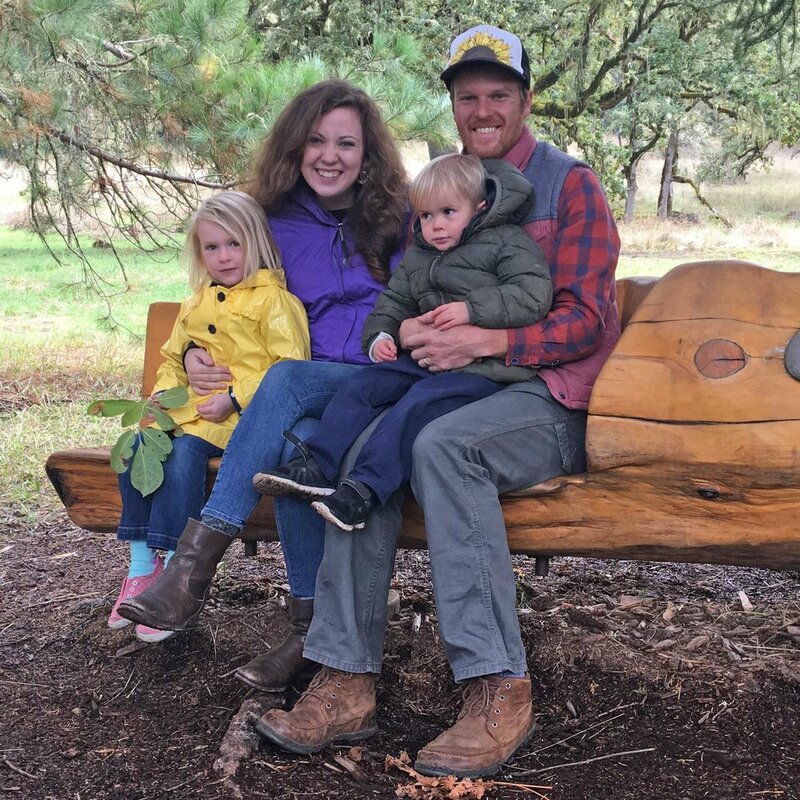 Allie Hymas is a mother, writer, and textile enthusiast raising two kids and a little herd of Icelandic Sheep with her husband Justin in Etna, California. Allie is passionate about worshipping God through music and gathering people around delicious food. Allie has been a guest worship leader at CitySalt twice in the past year.